Fresh off being swept in 4 games by the Houston Astros, the Phillies (70-57) travel to San Diego to face the NL West's first place Padres (76-50), who have the best record in the league. The struggling Phillies scored just 7 runs in the 4 games against Houston. Philadelphia has lost 9 games this month. Setting aside one of those losses (a 15-9 defeat by the Dodgers), the Phillies have totaled just 10 runs in their other 8 August losses. San Diego will send its young righty ace Mat Latos to the mound in game 1, hoping to further extend Philly's rough stretch. Latos has allowed 2 or fewer runs in a franchise record 12 consecutive games. 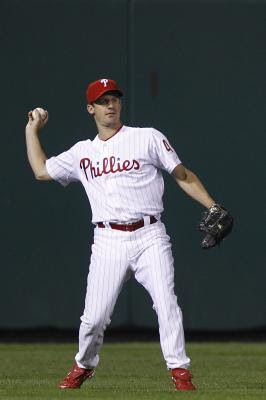 The Phils will counter with Roy Oswalt, who has a 1.90 ERA in 8 career outings in San Diego. Read ahead for loads of information on the pitching match ups and plenty more analysis on this series. Friday, 10:05pm. Roy Oswalt (9-13, 3.22 ERA) vs. Mat Latos (13-5, 2.33 ERA). In 5 starts as a Phillie, Oswalt is 3-1 with a 2.43 ERA. In 17 career games against the Padres, Oswalt is 10-2 with a 2.56 ERA. Oswalt is 3-1 with a 2.06 ERA in 6 starts at Petco Park. In 8 home starts this season, Latos is 4-2 with a 2.19 ERA. In his last 5 starts, Latos is 2-1 with a 1.80 ERA. Opponents are batting .192 against the 22-year-old Latos this season. Saturday, 4:10pm. Joe Blanton (5-6, 5.32 ERA) vs. Jon Garland (13-8, 3.25 ERA). In 9 road starts this season, Blanton is 1-4 with a 6.55 ERA. In his last 5 starts, Blanton is 1-0 with a 3.66 ERA. In 5 career starts against the Phillies, Garland is 0-4 with a 7.94 ERA. In his last 5 starts, Garland is 4-1 with a 2.01 ERA. Jayson Werth is 3-for-7 with 2 homers and 4 RBI in his career against Garland. Sunday, 4:05pm. Cole Hamels (7-10, 3.47 ERA) vs. Clayton Richard (12-5, 3.55 ERA). Hamels, a San Diego native, is 1-1 with a 2.18 ERA in 3 career starts at Petco Park. Miguel Tejada is 9-for-12 (.750 avg) against Hamels in his career. In his last 8 starts, Hamels has posted a 0-3 record with a 2.78 ERA. Richard in his last 6 starts is 5-0 with a 3.47 ERA. In 13 home starts this season, Richard has a 6-3 record with a 3.00 ERA. Adrian Gonzalez is a combined 18-for-49 (.367 avg) with 6 homeruns against Oswalt, Blanton and Hamels. Padres closer Heath Bell has been successful in all 13 save opportunities in the 2nd half. During that stretch, Bell's ERA is 1.76 and he has held opponents to a .167 batting average against. Earlier this week former Phillie Matt Stairs hit his MLB record setting 21st pinch hit homerun. Stairs is batting .200 in 59 games this season with the Padres. In the past week, Raul Ibanez is 8-for-25 (.320 avg) with a homer and 4 RBI. Since the All-star break, Ibanez's OPS is .920...prior to the break his OPS was .724. Chase Utley is a career .322 hitter with a .993 OPS in 39 games against the Padres. In 9 games since returning from the disabled list, Utley has posted a .235 avg. with no homers and 3 RBI. In 36 career games against the Padres, Ryan Howard has a 1.167 OPS. In 16 games at Petco, Howard has a .353 batting average with 4 doubles, 5 homeruns and 19 RBI.